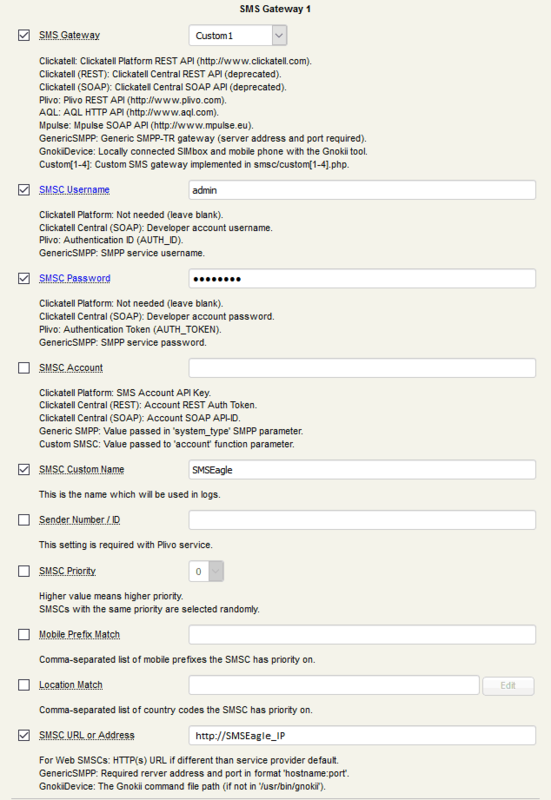 Here we describe how to setup RCDevs OpenOTP with SMSEagle for SMS one-time passwords. RCDevs OpenOTP uses HTTP API requests (see details: API). All you have to do at SMSEagle is to create new user for API access at webGUI. Place the plugin in your OpenOTP/smsc directory. it will be used as “Custom 1”, but if you already use it for other configuration, you can rename file to “customX.php” and than edit “smshub_custom1” in line 27 to “smshub_customX” where X is number from 2 to 4. 2. All configuration related to SMS Gateway settings messages is done from the SMS Gateway configuration. SMSC Username is username for SMSEagle API user you just created. SMSC Password is password for above user.